I'm usually all for furnishings, but mu favorite table clothes are just a couple yards of fabric (that cost under $20) so I'd have to say fashion today. If I had a 'real' size kitchen table, it would be table cloth. However I don't so im going with the shirt! PS_ Can we have a camera party with wine at my place soon, so i can pick your brain about how to redo my house!?! K, thanks! well I just got that shirt so I might have to vote on the shirt! That poppy shirt is the perfect color for Spring, I am going to go fashion. Happy weekend! 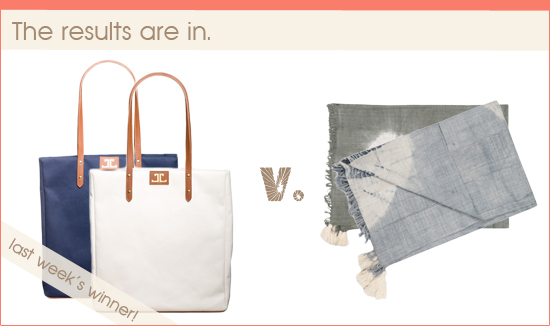 As much as I love J.Crew...I gotta go with the striped table cloth. I want both. I thought about getting that shirt last week, but my husband said he wasn't into it. I think I might have to override him though. I keep thinking about it. 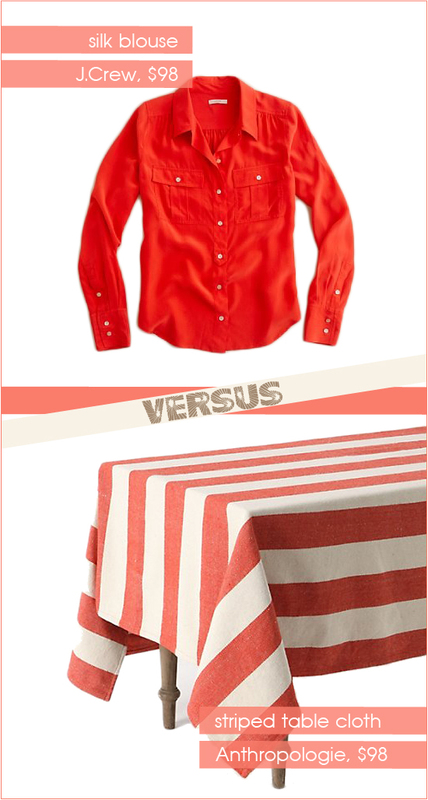 I guess if I have to choose, I'll say shirt, just because I don't think the colors of the tablecloth would go perfectly in my home... But yeah, this was a tough one. Definitely the tablecloth. The shirt is kind of boring, even though it's silk. I think I would go with that awesome table cloth. It's great and might inspire me to entertain more. Love the stripes, the color, yeap the tablecloth. I love the tablecloth, but would never spend $100 on it. The shirt, on the other hand, I would totally buy!! Tablecloths. I have finally come to an acceptance that button downs make me look like a lesbefriend.